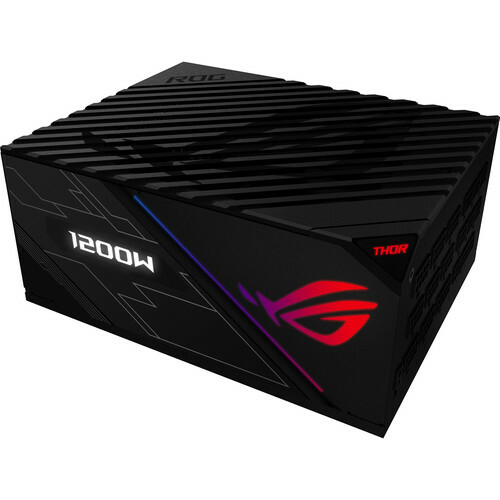 Built for enthusiasts who demand aesthetic excellence and performance perfection, the Republic of Gamers Thor 1200W 80 Plus Platinum Modular Power Supply from ASUS features one 24/20-pin motherboard connector, two 8/4-pin CPU connectors, eight 8/6-pin PCIe connectors, twelve SATA connectors, five 4-pin peripherals connectors, and one floppy connector. It also features Aura Sync RGB illumination, an integrated OLED information panel, a dustproof 135mm Wing-Blade fan, and a large heatsink that enables 0 dB operations, even at higher power draws. It integrates trusted, durable components, like Japanese-made capacitors, to achieve an 80 Plus Platinum efficiency certification. Included are a variety of modular, sleeved cables, plus other accessories. ASUS Aura Sync is an illumination ecosystem that lets you synchronize lighting effects across your gaming rig, components, and peripherals. The ROG Thor 1200W Platinum has addressable Aura RGB LEDs built in and ready for you to create your custom look. Two included connector cables allow you to plug directly into your ASUS motherboard or create a daisy chain with ROG Addressable LED Strips. Without using the Aura Sync function, the default effect and color will be static red. The ROG Thor 1200W Platinum features an integrated OLED panel, offering a real-time display of its power draw. Now, you can see at a glance how much juice your rig is using. ASUS has equipped the ROG Thor 1200W Platinum with a 135mm Wing-Blade fan to maximize component lifespan. IP5X dust resistance keeps it spinning freely and 0 db technology utilizes thermal sensors to allow the fan to switch off completely at lower wattages and enabling silent operation. The integrated ROG heatsinks have more volume than traditional designs, resulting in lower temperatures inside the ROG Thor 1200W Platinum. This enables cooler operations, extending the lifespan of components and allowing 0 dB operation long after standard designs would have to spin up their fans. The ROG Thor 1200W Platinum utilizes Japanese capacitors to help ensure efficient operations. This has earned an 80 PLUS Platinum certification, which delivers 89% efficiency at 100% loads, 92% at 50% loads, and 90% efficiency at 20% loads. The increased efficiency produces less heat, reducing fan noise and increasing reliability. ASUS knows you'll want to get building right away, so wthey've included high-quality sleeved and standard cables. The sleeved cables include 24-pin motherboard, 6+2-pin PCIe, and 8-pin CPU. They've also included an RGB connector that plugs into the addressable RGB header on your ASUS motherboard. ASUS backs the ROG Thor 1200W Platinum with a limited 10-year worldwide warranty, which only covers the power supply. The OLED panel and RGB LEDs are subject to a limited 3-year warranty. Box Dimensions (LxWxH) 15.0 x 9.6 x 5.2"